The Flippening - Is it Really Happening? The Flippening – Is it Really Happening? Bitcoin passes a new all-time high at $2933. Usually, this should spark unconditional cheering. But this time it is overshadowed by a worry; will other coins surpass Bitcoin? Will the flippening happen – will there be a change at the lead of cryptocurrency markets? Let’s start with the good, the wonderful news; bitcoins are traded for more than $2,800. This crazy rally exceeds the wildest speculations of the extremely optimistic Bitcoin community. Who would have expected just one year ago that today you will be able to buy an old car or an Ikea kitchen with just one bitcoin? Is there any other adequate reaction to this than to scream for joy so loud that it can be heard in the next city? Yes, there is. Obviously. In the cryptocurrency scene you find more and more people, which either jealously looks from Bitcoin at altcoins or Altcoiners pityingly looking at Bitcoiners. While Bitcoin made profits in a three-digit percent range, a lot of Altcoins easily show of with profits in a four-digit percent range. And as soon as now some start talking about the so-called “flippening” – the event that the coins flip and Bitcoin stops being the motor of cryptocurrency, while another coin takes the lead. Could that really happen? We look at the ranking of cryptocurrencies and which coin has the potential to kick Bitcoin from the throne. 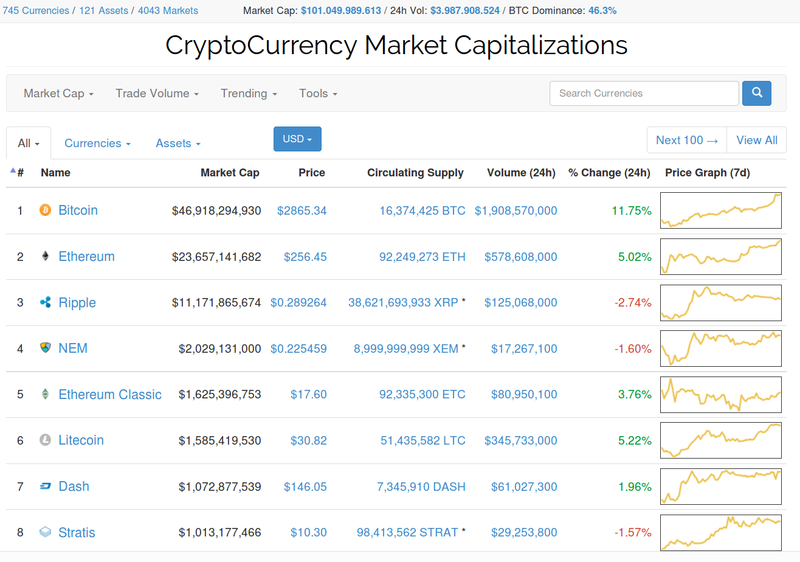 If there is a website you really need to bookmark when you learn about the flippening, it is Coinmarketcap. This site maintains API connections to a lot of exchanges and documents the price chart of a mass of cryptocurrencies. By multiplying the price of a coin with the number of its tokens, the site calculates the “market cap,” which is something like the full value of a cryptocurrency. On June 5, the cap of the whole cryptocurrency industry reached more than $100 billion for the first time. This number sums up the value of all cryptocurrencies. During April/May, it jumped up like crazy. In January 2016 the whole value of all cryptocurrencies has been $7 billion. In January 2017 it have been $15 billion. In April 2017 $28 billion. Then the chart started to climb absurdly steep to $100 billion. Why does this madness happen? It is not easy to find an explanation. Most likely it is a combination of several factors and the exaggeration of a bubbling market. Money is searching for a place where it can be secure, and it finds it in Bitcoin, the leading cryptocurrency, Ethereum, the weird, smart contracts platform, and in Litecoin, Dash and Ripple, established Altcoins, which promise some kind of security after being in life for around four years. The most interesting thing of the current bubble, however, is, how the value distributes on the coins. All historical bubbles, like in autumn 2013, have nearly exclusively been in Bitcoin. Today, however, it is built by several cryptocurrencies. 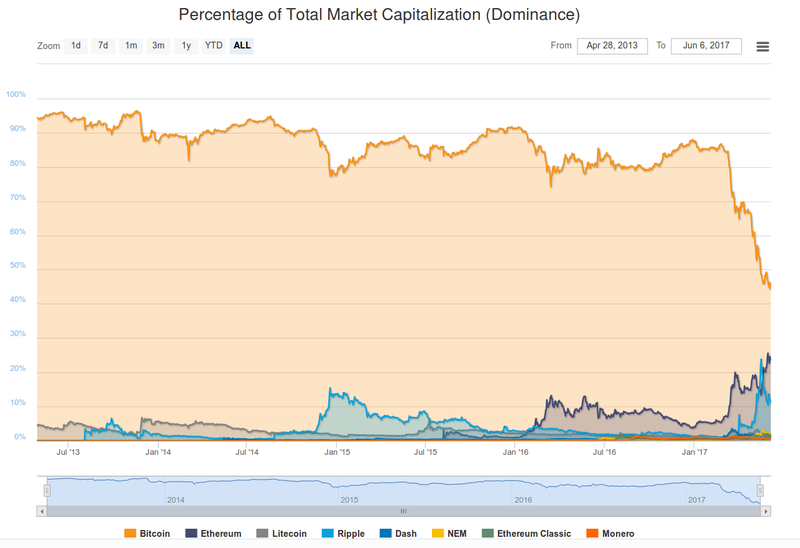 One chart finding more and more attention is the “Bitcoin Dominance Index.” It plots the share of Bitcoin of the whole crypto market. At the same time, the whole market started to shot up crazily, the Bitcoin Dominance Index did fall, not less crazily. Until March 2017 the Dominance Index did fall below 80 percent only in a few days, and even then it never went below 75 percent. In March however down it fell; 72 percent (March 17th), 65 percent (April 2th), 57 percent (May 5th). On May 16th the unthinkable happened: Bitcoin’s share of the whole crypto market dropped to less than the half. And since then it stays between 45 and 49 percent. The king is staggering. You don’t need much fantasy to imagine how this trend goes on. Bitcoin drops below 40 percent, falls on 30, tumbles maybe further down in the 20-something range … while at the same time other cryptocurrencies persist in catching up, and – if the trends continues – overtake Bitcoin. You can think that the future’s crypto markets will be more colorful. Maybe it will be unthinkable that a single currency will ever get more than 20 to 30 percent of the whole market again, and that we will use a large variety of cryptocurrencies, each for its own purpose: Some for private, some for public transactions, some for micropayment, some for smart contracts. And maybe Bitcoin will stay the digital gold, which is in the center of the whole market and gives all other currencies a value. This would be a scenario which takes the burden of paying everybody’s coffee from Bitcoin’s blockchain without attacking its role as the leading cryptocurrency. On the other side, you can argue, that there can only be one main cryptocurrency, as money is an item of network effects, like social networks like Facebook, and that it was the whole idea of a currency of the Internet to make the whole world wide web to a single monetary union. Will Ethereum Become the New Top Dog? One currency which qualifies itself for the flippening like no other is Ethereum. The 2015 born blockchain with a Turing complete scripting language in its core started an ascent in early 2016 which is spectacular, even in the crazy crypto markets. In January 2016 one Ether was worth $1. During 2016 it reached $10 to 15. Even in March 2017, it has been only $16. In April however it did rise to $50, in May to $100, and now it is above $250. Bang! That’s how you do the ascent. Right now Ethereum has become the de facto lead currency for ICOs like recently BAT of Brave. On many Altcoin exchanges Ethereum has become a second lead currency for the nomination of other altcoins, and Shapeshift’s CEO Eric Vorhees recently announced that his exchange keeps a part of its income in Ether. Thanks to the endless possibilities of smart contracts, Ethereum has become a strong magnet for new developers, which are usually turned off by the toxic atmosphere of Bitcoin development. And with around 200,000 transactions a day Ethereum is used nearly as much as Bitcoin. While Bitcoin Core developers seem to dither and be afraid of their own success – you could think the wish back the time when nobody used Bitcoin – the Ethereum developers are hungry for success and load everything on the Ethereum blockchain which does not defend itself against. And further Bitcoin still has the smell of the money of dubious people, of hackers and drug traffickers, which still makes it a red flag for banks – while Ethereum is seen as a white cryptocurrency, something to enable blockchain technology. Banks not only don’t dislike it – they love it. The belief to be the future is strong in the Ethereum Community. It is backed by a market cap of $23 billion, which is as much as Bitcoin had in early May and more than the half of Bitcoin’s current market cap. There is not so much way to further pass. 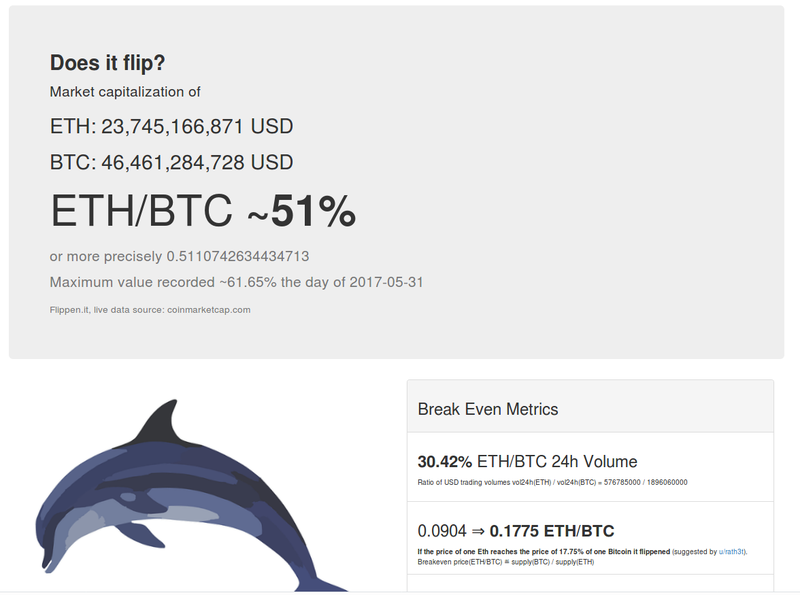 The Ethereum community is eagerly awaiting the moment, so strong that they even made a website which tracks the flippening. However, there is a number of reasons why the flippening will not go as smooth as the Ethereum community wished it to be. First, the name. While Bitcoin is a catchy term for digital cash, Ethereum is something more abstract and wishy-washy – and in many countries people don’t even know how to pronounce it. Most Germans, for example, will not know how to speak it. Second, Ethereum is by far not as much developed as Bitcoin. There are no or only very few Ethereum ATMs, wallets for mobile devices, light wallets, no or only rare OTC trade like LocalBitcoins, nearly no acceptance in sales and so on. Ethereum is a thrilling platform for smart contracts and token sales for project funding – but it has a long way to go to compete with Bitcoin as digital cash. Digital tokens do not become money over night. It is a long and viscous process. Third, Ethereum needs to proof that it can scale as it promises. For Ethereum scaling is a lot more concerning as for Bitcoin, since it does not only load transactions on the blockchain like Bitcoin does, but also self-executing contracts and token, or, other said, code. The result is that the 200,000 daily Ethereum transactions already require more resources than the 300,000 Bitcoin transactions. If Ethereum delivers what it promises – to decentralize all the things on its blockchain, games, contracts, exchanges, markets – then monetary transactions will only take a small share of Ethereum’s traffic. To host the same monetary activity as Bitcoin, Ethereum needs a lot more capacity. And right now there is no proof that the developers will be able to make this happen without letting the weight shatter the blockchain in pieces. So, the tendency of the charts might seem determined to the flippening from Bitcoin to Ethereum as a lead currency. But the hard facts raise serious doubt that this can happen in the foreseeable future.